Next Sunday, April 13th, I will take part in the Rotterdam Marathon together with the usual suspects (Jaime, Serna and Manuel). I am arriving to this marathon a bit short of training as I already reflected at the time of running Blagnac’s half marathon about a month ago. I may have completed just about 2/3 of the training plan I followed, having run just about 500km in the 16 weeks preceding the marathon. Thus, in this preview instead of talking about how I arrive to it I wanted to focus on the front of the race. Rotterdam marathon is one of the fastest marathons in the world nowadays. On top of that, I learnt a few weeks ago that Kenyan athlete Eliud Kipchoge will take part in it. Kipchoge has today the 7th best time (1) in the distance (2h4’5″), achieved in only his second attempt at a marathon, in Berlin on the 29th of September 2013, when Wilson Kipsang beat the World Record (2h3’23”). I then wondered whether on Sunday a new world record could be set. To be clear, setting up an athletics record is not an easy feat. Especially not in a marathon. 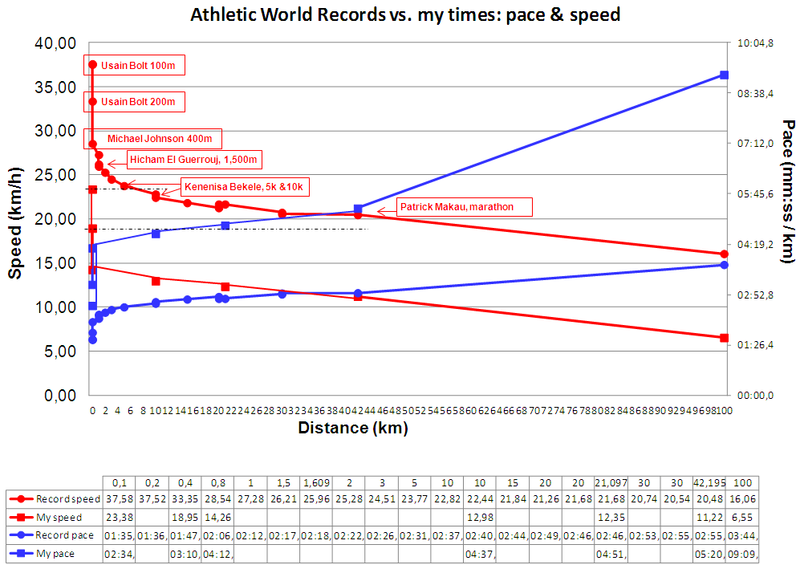 But taking that question as a departure point I deep dived a bit into the data in order to learn more about the race. The last time the marathon WR record was set in Rotterdam was in 1988 (26 years ago), when Belayneh Densamo left it at 2:06:50. Since then the WR has been beaten 8 times; once in Chicago, once in London and 6 times in Berlin, among them the last 5 times (see here the progression). Thus, we could confidently say that Berlin is the fastest marathon nowadays. In the table you may see that out of the 14 years Berlin was the fastest of the 4 marathons in 7 (50%), however Rotterdam was the fastest marathon in 4 of those years (with a best time of 2h4’27”). 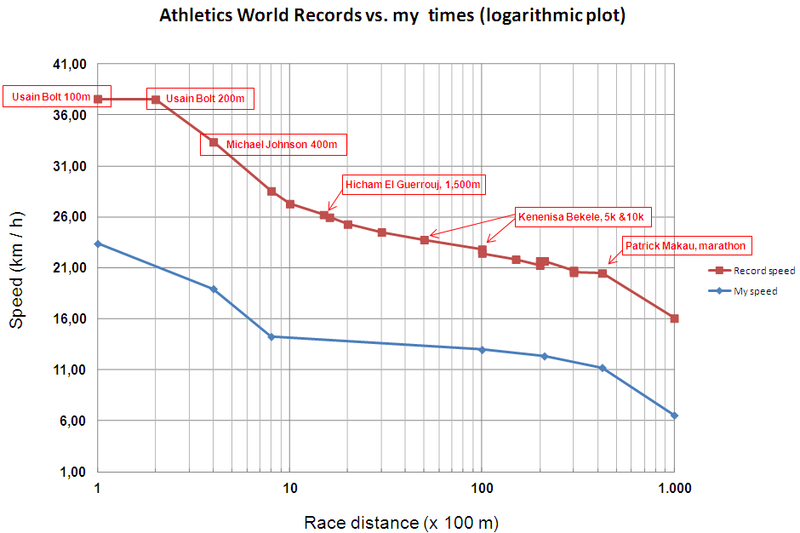 By average winning times it would came 3rd (with a 2h6’32”) just after Berlin and London. A curiosity, only twice in the past 14 years has the same runner won both Rotterdam and Berlin marathons in the same natural year: Felix Limo (2004) and Patrick Makau (2010) (2), both times each runner made a faster time in Rotterdam. My train of thought then suggested: you are only paying attention to the winners’ times, you should compare more times to sense the profile of the race. I then found the following terrific website with all time best performances in track and field (maintained by Peter Larsson). With that database the analysis was rather simple. Berlin: 15 of the 100 all-time best times were achieved in Berlin, with a top 5 average time of 2h3’53” and a top 10 average of 2h4’18”. Chicago: 13/100; 2h4’29” (top 5); 2h5’4″ (top 10). Dubai: 18/100; 2h4’39” (top 5); 2h4’46” (top 10). Rotterdam: 14/100; 2h4’40” (top 5); 2h5’54” (top 10). London: 14/100; 2h5’02” (top 5); 2h5’15” (top 10). 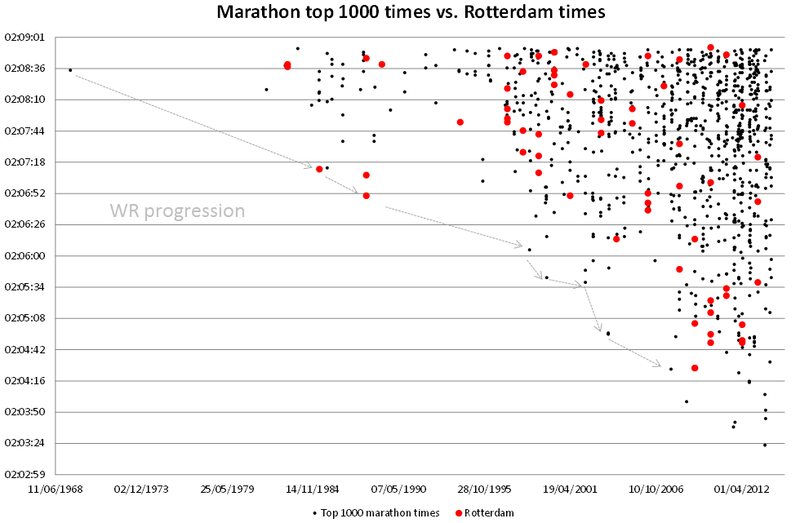 Taking into account the top 100 times, Rotterdam marathon falls to the 4th place, seeing the irruption of Dubai as one of the top marathons, with all those times achieved in the last 6 years (run since 2000). Marathon top 1000 times vs. those achieved in Rotterdam. Runners among top 1,000 marathon times having run consecutively in Rotterdam and Berlin. Of the top 1,000 marathon times, 16 runners achieved some of then running consecutively in Rotterdam and Berlin (or viceversa) (3). I made this comparison assuming that they must have been in a similar fitness (though not necessary). Of the 16, 9 of them achieved the better time in Rotterdam, 7 in Berlin. Among those times, the best 4 were achieved in Rotterdam (James Kipsang Kwambai, Patrick Makau, Geoffrey Mutai, Abel Kirui). In the last 16 years the marathon WR has been beaten once every second year (8 times). Rotterdam is arguably between the 2nd and the 4th fastest marathon. However, the best time in Rotterdam (2h4’27”, Duncan Kipkemboi in 2009) is only the 14th best time overall. Kipchoge PB is among the top 7 times after only his 2nd attempt at the distance. 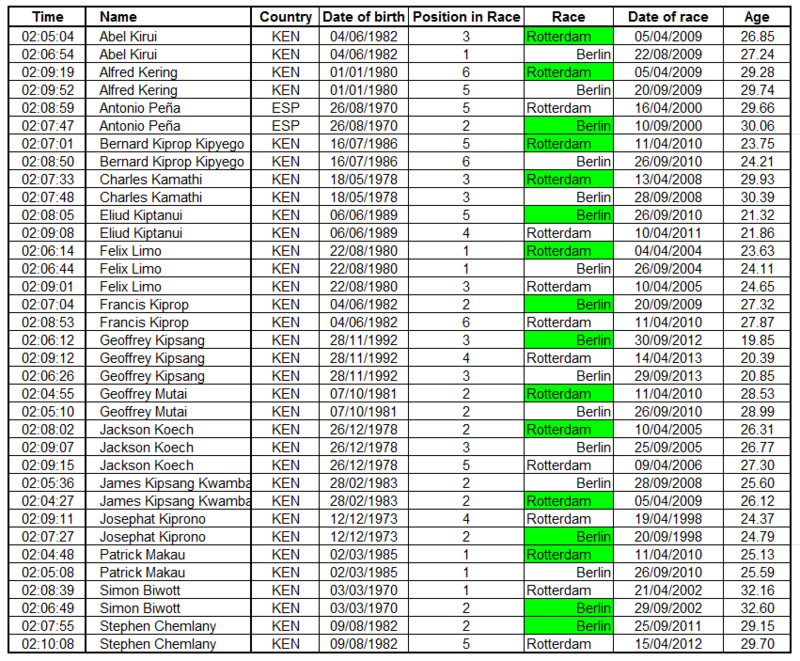 Kipchoge ran in Berlin in September 2013 (2h4’5″), chances are that he beats that time running consecutively in Rotterdam in 2014. Given the size of the feat I would not bet much on it, but I would not discard it either. Either way, I will only discover what happened about 2 hours after the race, at the front, has finished. In case you feel like cheering me up and feel sorry for being thousands of kilometers away, don’t worry: click on this link and you will arrive at a website provided by the organization in which you can leave either one or two support messages that will be shown to me when I run by the kilometer 37 or I am just 500m from the finish line (my bib number for this race will be 1599). (1) Excluding times from Boston and other races not qualifying for IAAF world records. (2) A year later, in 2011, Patrick Makau set a new WR in Berlin, 2h3’38”. (3) Felix Limo, Geoffrey Kipsang and Jackson Koech run 3 consecutive races in a row each.